Daniel Wade is an Irish poet and playwright from Dublin, Ireland, and has been working with language in its many forms since 2007. A graduate of Dún Laoghaire Institute of Art, Design and Technology, where he studied English and Journalism, Daniel's poetry has been published in journals and anthologies including Optic, Limerick Revival, Wordlegs, The Stony Thursday Book (ed. Paddy Bushe), HeadSpace Magazine, the Seven Towers 2014 Census, Bray Arts Journal, The Sea (charity anthology in aid of the RNLI), Sixteen Magazine, The Bogman's Cannon, Iodine Poetry Journal, Zymbol, HeadStuff, Coast Monkey, FLAR 17, Tales From the Forest, and The Runt. In April 2015 he was the Hennessy New Irish Writing poetry winner, published in The Irish Times. He also writes a monthly poetry column for Coast Monkey, entitled 'Poems from the Coast'. Daniel has been a guest on Dublin South FM's Rhyme and Reason poetry program, and Near FM's Writer's Block. In June 2015, his radio drama, The Outer Darkness, was broadcast on Dublin South FM. A prolific performer, Daniel has read his work at festivals including Electric Picnic, Body and Soul, Noeliefest and the West Belfast Festival. In January 2017, his sequence of haibun poems 'Iceberg Relief' was published as an e-chapbook by Underground Voices and is available for download (see 'Iceberg Relief' section below). 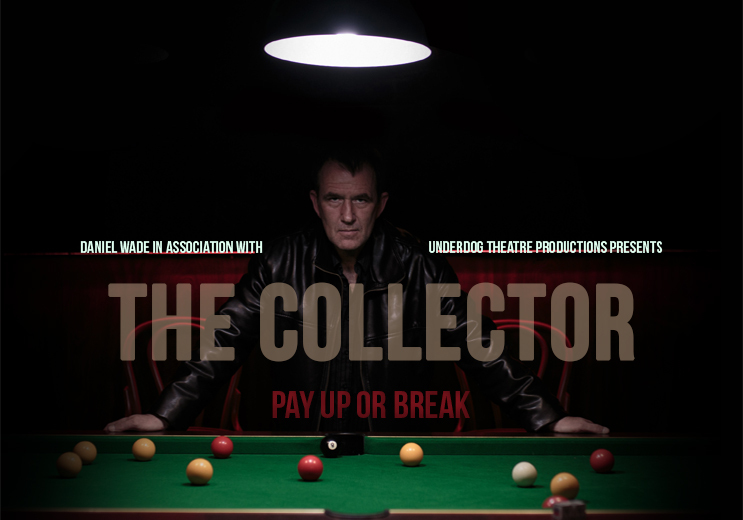 In January 2017 his play The Collector was staged in The New Theatre, Dublin. Currently residing and working in his native Dublin, Daniel is at present working on his first novel. Recordings of his work can be heard on Mixcloud and Soundcloud. For professional booking, contact Daniel at danielpwade@gmail.com. Daniel Wade's debut album "Embers and Earth" is a sequence of spoken-word poetry set to music. Featured on the album are musicians Gavin Ralston, Paul Wade, Justin McCann, Steve Wickham, Brian O’ Brien, Jim Tate, Kevin Wade, and John Walsh. "Embers and Earth" was recorded and mastered over a five-month period in the intimate confines of Silverwood Studios, the Wicklow-based recording studio of veteran engineer Gavin Ralston. The album is now available on iTunes , Spotify and Apple Music. In the Dark Horse Pool Academy, the games go on long after closing time and only the toughest customers last the night. Oren Collins, a small-time thug and the hall’s best player, must finally confront the death of his brother, a long overdue debt to a loan shark, and his conscience. A play of invidious secrets and broken masculinity, The Collector simmers to a disquieting conclusion. Starring Graeme Coughlan, Will Murphy, Michael Heavey, Kevin Brennan and Joseph Duggan. Written/produced by Daniel Wade and directed by Cian Ó Ceallacháin in association with Underdog Theatre Productions. Funded through an online crowdfunding campaign hosted by Kickstarter. "... its violent heart is in the right place... viciously, convincingly brutal in its portrayal of soulessness and despair, and is well-staged enough to make you not want to look away." - The Irish Independent. "Wade sensitively explores the alarming rate of suicide among Irish men, and no glib answers are found." - The Sunday Times. "The Collector’s success helps to show how independent new Irish writing and theatre can flourish. A thrilling evening’s entertainment not to be missed. **** " - The Reviews Hub. Deeply fascinated with the sea, Daniel’s poetry interrogates themes of voyaging, homecoming and the urgent role played by the ocean in much of Ireland’s historical and contemporary struggles, as well as the far-ranging legacies of exploration, boat-building, shipwreck and rescue operations. Many of Daniel’s poems are featured in a monthly column entitled ‘Poems from the Coast,’ which was written in conjunction with Coast Monkey, Ireland’s premier maritime and coastal heritage website. 'Muglins' featured as part of the Pale Project exhibition in dlrLexicon. Iceberg Relief is a sequence of haibun poetry which tells the story of the cargo ship MV Iceberg I and its 24 crew members, who were held in captivity between March 2010 and December 2012, after their vessel was hijacked in the Gulf of Aden by Somali pirates. The kidnapping, which took place roughly around the same time as the 2010 Copiapó mining accident and received virtually no international media scrutiny, has the dubious honour of being the longest-recorded hostage situation of its kind to occur within the region. Drawing on interviews and media reports with several of the surviving crew members, Wade recreates their thoughts and voices through the format of haibun, a poetic format which originates in Japan. Properly defined, a haibun is a short pose poem prefaced by a haiku; it typically describes its subject matter in a pithy, almost journalistic, fashion. Many of the poems in this e-book are either based or directly quoted from actual statements and observations made by surviving members of the Iceberg crew following their release from captivity. Published by Underground Voices in January 2017, 'Iceberg Relief' is available for download as an e-chapbook from Amazon . I’m not superstitious. I have no morning prayer with which to steel myself against the day’s exertions. No affirmations, no clichéd mantra to repeat over and over until I believe it. What I have instead is a ritual. I reach up, take the razor down from the cabinet, as if arming myself. I lather on cream, run the tap, avoid eye contact with the mirror. I prefer a wet shave over the annoying buzz of an electric razor; the steam rising from the sink, the water’s hot calm, the blade’s triple sheen. I’ve been shaving since I was fifteen. As with any ritual, it’s taken me a while to get right. But the motion of lather, stroke and rinse has now become so routine, so automatic, I barely even notice it. Muscle memory does all the work. Outside, Annie makes coffee. I hear the familiar sound of our usual mugs – hers plastic and reusable, mine the heavy drink-in variety. I rake the blade along my jaw and chin, under my nose, along flesh that has never known cold or bruises. I stop only to dunk the blade in water, slosh it around and raise it once more to look for loose stubble. Bristles float in the basin, the dregs of myself. I shear it all off. But I cannot shear off the look of shame molding my face. Annie knocks on the door, asks me when I’ll be finished. I tell her I’ll be out in a second; I’m hoping she’ll walk in and cut my thoughts loose. But I don’t want her to see the blood. The razor is a household object; it has its purpose, and, unlike most of the things I fill my life with, always will. Adverts for it make promises of upgrade, greatness, betterment, worming and whispering their way into my head. Shave with our razor and you’ll be a better man, they urge. The razor can be cleaned and replaced, sharpened and repaired. It is formidable in its simplicity. When it’s no longer suitable for the job, it will be discarded. I’ve read somewhere that young Roman men would shave before an audience, as part of a rite of passage into maturity. But I do this alone, without any audience or witness. I still manage to cut myself here and there, and have to start again. A scarlet bead oozes down my neck, plops onto the tiles before I can catch it. I curse to myself. I should have stopped making that mistake by now. But my mistakes always bear repeating. I am finished. I drop the blade in the water, hear it clatter off the porcelain. The mirror is misted over, so I give it a quick wipe. Unavoidable now, I don’t recognize the man staring back at me. I look raw and pink, as if sunburnt. I pull the plug in the sink, listen to the low gurgle of the water escaping, rinse off any stray hairs still clinging to the basin. I’m still standing there when Annie walks sleepily in, and wraps her arms around my chest. We hold each other for a while, exchange a few cozy kisses, and then she goes to shower. Soon she’ll dry herself down, get dressed, and go through a ritual of her own before work. When she eventually leaves, belted and buttoned in a black coat, evoking a tip-off seeking spy, she’ll walk briskly and with intent, closing the door with a promise that I’ll see her later that night. She vanishes at the corner, her absence guessed by an interval of hours. I sit down at the laptop. Note: This piece was commissioned by the Irish Writers Centre for the annual Culture Night celebrations of 2017, which took place on the 22nd of September of that year. It is true that the Irish have a long history of fighting other nation’s wars. From the galloglaigh or ‘gallowglass’ corps of elite mercenaries deployed to assorted conflicts across mainland Europe in the 1500s, to the 40,000 documented Irish ex-pats who fought for the Union and the 20,000 who fought for the Confederacy during the American Civil War, the Republican and Blueshirt volunteers who signed up to fight one another in the Spanish Civil War, as well as the thousands who swelled the British Army’s ranks in WWI (and indeed, the countless more who wore a British Army uniform down the centuries), not to mention the 5,000 members of the Defence Forces who enlisted to fight in WWII, following Ireland’s officially neutral position in that particular conflict, and who were later branded deserters by the Irish government of the day upon their return. This isn’t even including the pioneering work undertaken by Irish-born war correspondents such as Peter Finnerty and Sir William Howard Russell, who covered the Napoleonic wars and the Crimean war respectively, as well as Samuel Beckett, who volunteered with the French Resistance in WWII and was awarded a Medaille de la Resistance for his efforts. To this end, it is no surprise that Irish poetry has rarely shied away from addressing bloodshed and the full effects of warfare. The Tain Bo Cuailnge arguably counts as the definitive Celtic war saga, while Piaras Feiritear, who fought in the Confederate Ireland wars, ranks as an invaluably early example of a soldier-poet writing in the Irish language. In the contest of the Easter Rising, Padraic Pearse, Joseph Plunkett and Thomas MacDonagh were each published poets, and the outpouring of poetic tribute to them subsequent to their executions, from authors as disparate as James Stephens, Katherine Tynan, AE and Francis Ledwidge, proved once more that poetry is instrumental in making sense of bloodshed’s aftermath throughout the nation’s most historic events. Meanwhile, in the trenches of WW1, Tom Kettle and the aforementioned Ledwidge (both avowed nationalists) would become known for their poignant verses, if not for their direct depiction of the war itself, and would come to symbolise the loss of the Irish involvement of in the trenches. W.B. Yeats repeatedly addressed the thorny and troubling effects of the Easter Rising, the War of Independence, and the Civil War upon Irish life during both their duration and aftermath in poems such as ‘Easter 1916’, ‘An Irish Airman Foresees His Death’, ‘The Second Coming’ and the long poetic sequence ‘Meditations in Time of Civil War’ (and also infamously refused to write about WW1 in ‘On being asked for a War Poem’). Later on, the growing sectarian tensions that would eventually culminate in the Northern Irish Troubles and the growing crisis of same is tackled by a plethora of poets such as Seamus Heaney, Paul Muldoon and Michael Longley (the latter in particular noting time and again the lingering after-effects of battle on his father, who had seen service in WW1). Yet for all this, and in spite of exquisitely exhaustive anthologies such as the 2009 Gerald Dawe-edited Earth Voices Whispering: An Anthology of Irish War Poetry 1914-1945, there is no longstanding equivalent tradition of Irish war poets to equal the pantheon of that encompassed Owen, Sassoon, Brooke, Gurney and Thomas. it is actually Ireland’s long association since the founding of the State with overseas peacekeeping operations that has proven to be its most prominent and exemplary martial endeavour on record. Following Ireland’s 1955 entry into the UN, the Irish Defence Forces has found itself involved in various peace support and crisis management missions, chiefly in the Middle East. Irish peacekeeping missions, under the various auspices of UNFICYP (the Congo), UNDOF (Syria-Israel Border) and UNIFIL (Lebanon), to name but a few are examples of this tradition. Indeed, the recent return of Irish troops from the 50th Infantry Group, on April 7th, to Dublin Airport after a six-month deployment to the Golan Heights on behalf of UNDOF, indicates the currency of this aspect of Ireland’s international relations. Since the beginning of these operations, there have been 85 recorded deaths among Irish military personnel. Hence, the debut collection of Tallaght-based poet Michael J. Whelan, entitled Peacekeeper, is the first such volume of poetry to address this fascinating if often-overlooked aspect of Irish history and current affairs. Whelan himself is a member of the Irish Defence Forces and has seen service in South Lebanon and Kosovo as an Irish United Nations support operative. Because his poetry has the added credential of being authored by a former member of the Irish Defence Forces, it draws immediate comparisons with the poignant and often harrowing poetic accounts of modern warfare by contemporary American war poets Brian Turner (Here, Bullet) and Kevin Powers (Letter Composed During a Lull in the Fighting), both veterans of the Iraq War. As such, it is a slim and unassuming volume, but certainly not a trivial one. when I enter the City of David. but he looked into me. As already stated, there is no prettification or avoidance of the sanguine realities of warfare in Peacekeeper. The imagery Whelan makes use of is visceral, uncompromising, cinematic and yet, the reader instinctively feels, somehow true to life, reaching a stark vividness on a par with the horrific nightmare-verses of Wilfred Owen. A boy buried in rubble is found by his grandmother: “his shrapnel body lashed to the ruins/and mixed with false promises,” fresh rain falls “to wash away the footprints of killers/and the hopes of the hurting,” a fatal wound is “the ball of his knee hanging,/attached by loose skin and gristle/and wrapped in a bloody white shirt. But to counterbalance the carnage are the evocative landscapes in which Whelan the soldier finds himself deployed to. Binaries are in the very nature of peacekeeping, insofar as soldiers fighting to keep the peace is in itself a contradiction in terms. The sheer physical beauty of the Lebanese countryside acts as a fragile counterbalance to the carnage threatening to engulf it. and I know it can never be as it was. Overall, Peacekeeper is a challenging, robust debut collection and a clear result of years of contemplating and traversing such disturbing terrain where violent death is an everyday occurrence. With these poems, Michael J. Whelan has achieved something very singular that deserves to be read by soldier and civilian alike. And where all of the signs seem to be leading me to you. Who flags you down for driving too fast. before they slip behind the sun. Cruelty, by implication, is by design. O’ Neill’s skill for the redolent image, the evocative vision, are on full display. A crowd of rush-hour Londoners is described as ‘battle-hardened Amazons/In their mid-thirties march through the labyrinth/of streets and corridors in pairs’; a page-three girl becomes ‘a paper Venus, Madonna of the celibates/who kneel before you to offer up their prayers’; ‘blood and death coagulate in the mercy cup’ in ‘Burlesque’; a speedboat observed from a distance in Dunmore East is ‘an amphibious car.’ The synthetic ostentation of contemporary pop culture and advertising is aligned (and implied to possess the same sense of time-defying durability) with the lofty masterworks of the Renaissance era, and past, present and future are in constant friction with one another. Under an Armani billboard in Rome depicting David Beckham “like a colossus/evoking Michelangelo”, the immediacy of the present moment and the timeless are conjoined like yin and yang forces, perennially at odds yet inextricably defined by their very contrast. Tissue box, tower above us. The sky lit up, a safari. Without a map, whose country is northless. Were we in our own actions. Divertimento is ultimately a book of dualities and nuance. O’ Neill emerges as poet operating with a plethora of influences looking over his shoulder, yet also resolved to exert his own style and poetic identity. His work stands as a singular and under-looked, at a remove of the Irish canon, but not completely disengaged from it. This ability to stand alone and to also be able to shoulder that aloneness are what makes this collection an absorbing and challenging read.